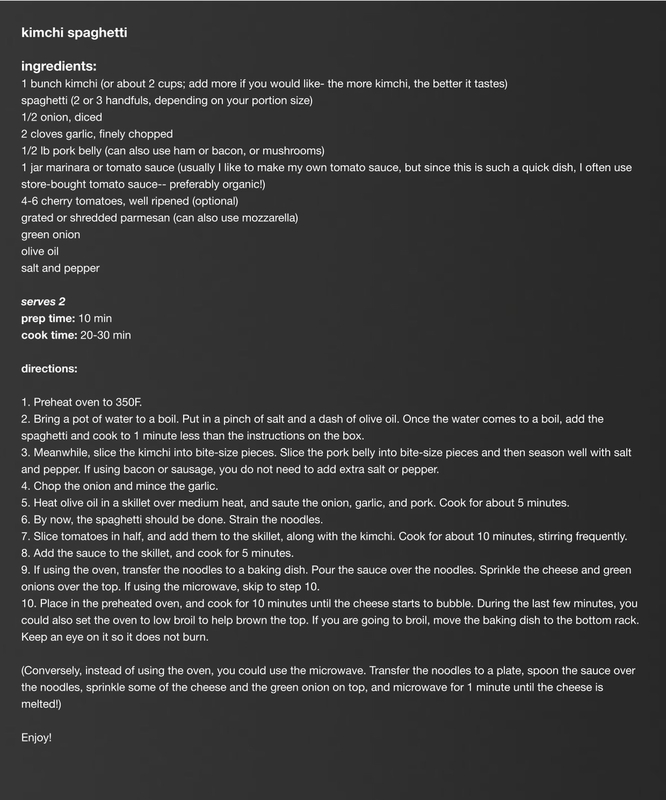 For my very first post, I had to upload one of my all-time favorite recipes. I've made this one more times than I can count, and it is still so delicious every time. This is Korean-Italian fusion at its best. I don't know when the whole kimchi-cheese craze started, but whoever thought of it was a genius. Now there's cheese in all kinds of Korean dishes. Most of the time, Korean fusion dishes call for mozzarella cheese, and I think for a good reason. Mozzarella has a fresh, subtle flavor that is not too overpowering, so it blends harmoniously with Korean foods that are already packed with spices and flavor. If you are unfamiliar with kimchi, it is fermented cabbage... while that sounds a bit unappetizing, it is the most essential condiment/ side dish in the Korean culture. Usually present at every meal (breakfast, lunch, dinner), some people say that an average Korean consumes 40lbs of kimchi in a year! Made with a delicious mix of garlic, ginger, chili peppers, vinegar, and other spices, you can find kimchi in most Asian grocery stores. Buying a big jar will last you a good month/ month and a half, and when it starts to turn a bit sour, you can cook all sorts of things with it (kimchi jjigae/stew, pancake, etc)-- in fact, if you're cooking with kimchi, it actually tastes much better to cook it when it's sour, rather than fresh. Another reason I wanted to have this as my first post is that apparently one of my favorite k-pop artists, EXO's main vocal D.O./ Kyungsoo, really enjoys cooking and also makes a version of this dish quite regularly for all of the members! Anyone who knows me well knows that I'm a huge k-pop fanatic! I think D.O. has a truly unique voice that's versatile and suits not only pop songs and ballads, but also R&B-- not something all Korean artists can do. Baekhyun and Chen (other EXO vocal line) may have wider ranges, but D.O. has a more controlled voice, and I think he definitely has the potential to release a solo album in the near future! while the pronunciation is a little off at times, his english is pretty impressive for a non-native speaker! Anyways, moving onto the recipe! This recipe is a mix of budget-friendly ingredients, and perfect for college students. As mentioned above, it's better to use kimchi that is well-ripened/ tastes almost sour. Note: I usually like to eat very healthy, but if I have one weakness, it's pork belly-- which is why I usually put in pork belly when I make this. Pork belly & kimchi are a popular combination in Korean cuisine. Often people also stir fry kimchi with ham or bacon, because kimchi and pork just go really well together. 1. Preheat oven to 350F (if you wish to save time, you can use the microwave instead-- refer to step 10). 2. Bring a pot of water to a boil. Put in a pinch of salt. Once the water comes to a boil, add the spaghetti and cook to 1 minute less than the instructions on the box. 3. Meanwhile, slice the kimchi into bite-size pieces. Slice the pork belly into bite-size pieces and then season well with salt and pepper. If using bacon, you do not need to add extra salt or pepper. 4. Chop the onion and mince the garlic. 5. Heat olive oil in a skillet over medium heat, and saute the onion, garlic, and pork. Cook for about 5 minutes. 6. By now, the spaghetti should be done. Strain the noodles. 7. Slice tomatoes in half, and add them to the skillet, along with the kimchi. Cook for about 10 minutes, stirring frequently. 8. Add the sauce to the skillet, and cook for 5 minutes. 9. Pour the sauce over the noodles. Sprinkle the cheese and green onions over the top. 10. Place in the preheated oven, and cook for 10 minutes until the cheese starts to bubble. During the last few minutes, you could also set the oven to low broil to help brown the top. If you are going to broil, move the baking dish to the bottom rack. Keep an eye on it so it does not burn. Place on a plate and dig in! !